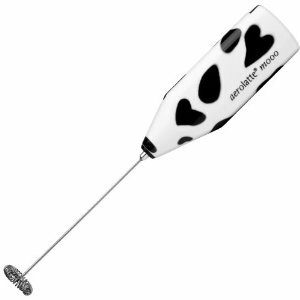 Aerolatte Milk Frothers are the world-famous, award-winning, best-selling original steam-free milk frother. Safe and easy to use, the Aerolatte milk frother eliminates the need for expensive steam-based machines. It works directly in your mug or glass using an innovative whisk-head to turn milk that has been heated in the microwave or stovetop into rich, thick foam in just 20 seconds. Use for lattes, cappuccinos, milkshakes, and hot chocolate. Aerolatte Mooo has a fun Holstein spot pattern and comes with a travel case. Thicker shaft, liquid resistant seal, longer lasting motor � Aerolatte. Includes instructions, recipes, and 2 AA batteries.